The NovelAire DH 250 desiccant dehumidifier is a commercial unit designed for a wide range of applications such as storage rooms, vaults, small manufacturing and industrial processing centers, museums, archives, and water damage restoration. Desiccant dehumidifiers are preferred to refrigerant units in conditions where the ambient temperature is low, including below freezing point, and/or where an extremely dry atmosphere is required. Refrigerant dehumidifiers reduce moisture levels by condensing water vapour on to a cold surface. This process is effective and efficient at temperatures between 50°F and 80°F (10-27°C) but refrigerant units struggle at lower temperatures due to the formation of ice in the dehumidifier and require defrost systems to deal with it. A desiccant dehumidifier uses a chemical process to "capture" water molecules on the surface of the desiccant, a process known as adsorption. This process is not susceptible to freezing, allowing the dehumidifier to operate to temperatures as low as 0°F (-18°C), way below the capability of a refrigerant dehumidifier. For this reason a desiccant dehumidifier is always the type chosen for applications where the ambient temperature is close to, or below, the freezing point of water. Refrigerant dehumidifiers also struggle to remove moisture at lower levels of relative humidity, particularly below 40%. Because NovelAire Dehumidifiers use a desiccant process they will continue to reduce moisture content below this level and the DH 250 is capable of maintaining a level as low as 20%RH if required. At very low levels of relative humidity it is important to keep the dry area sealed as long as possible and to assist with this requirement a remote humidistat is available as an optional accessory. The NovelAire DH 250 is a powerful unit capable of removing 184 pints of water at the AHAM standard (80°F (27°C) and 60% relative humidity). In cooler, drier conditions, or course, much less moisture will be removed but these are the conditions where a desiccant dehumidifier comes into its own. The DH250 is designed for permanent installation but may be used as a portable dehumidifier, particularly for water damage restoration work. Its compact dimensions, rugged construction and manageable weight make it a suitable choice where extreme drying is required. For use as a portable dehumidifier the DH250P is available with carrying handles and wheels to assist on-site movement. In any application the NovelAire DH 250 requires ducting. This unit does not require water collection or drainage as it produces no condensate. The water adsorbed by the desiccant wheel is forced out again by a stream of warm air through which every part of the wheel passes during one rotation. This moist air has to be carried outside the drying area and this is one reason why ducting is necessary. The ducting may be permanent or temporary depending on the particular application. 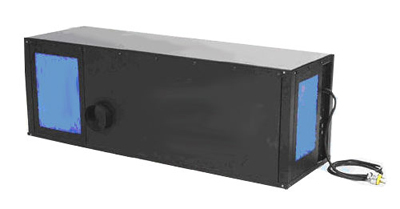 The DH 250 is a durable unit with industrial quality, robust components housed in a cabinet of 20-guage, bonderite or electro-galvanized (EG) sheet metal and fully insulated with ½-inch thick fiberglass insulating panels. Removable access panels are provided to facilitate maintenance. For added resistance to harsh operating conditions all exposed surfaces are finished with a standard epoxy primer and two coats of acrylic urethane enamel to a dry film thickness of 1.5 to 2 mil. The desiccant wheel inside the NovelAire DH 250 uses silica gel to adsorb the water vapor from the air. Its exterior consists of 20-gauge, stainless steel rim that is chain/spoke driven by a heavy duty motor. The wheel is covered by a one year warranty against manufacturer defects and operational performance is warranted for five years.